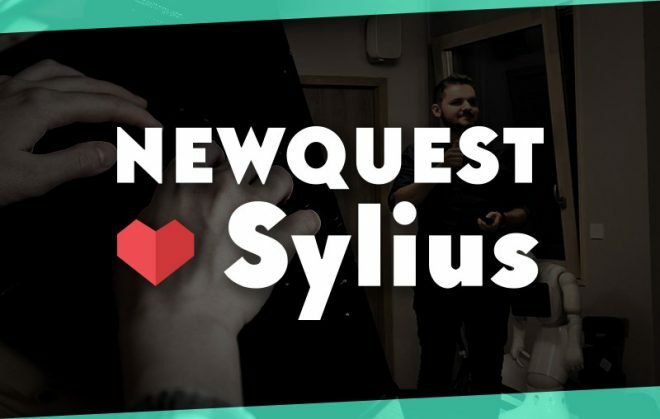 If you’ve been following NewQuest on social networks for a while, you’ve probably already had the chance to get to know several of our robotic companions. Recently, we wrote an article to showcase our faithful friend Pepper, who’s been part of our daily life at NQHQ for a little over a year now. Today we have the pleasure of introducing the latest addition to our (rapidly growing) family: Keecker. 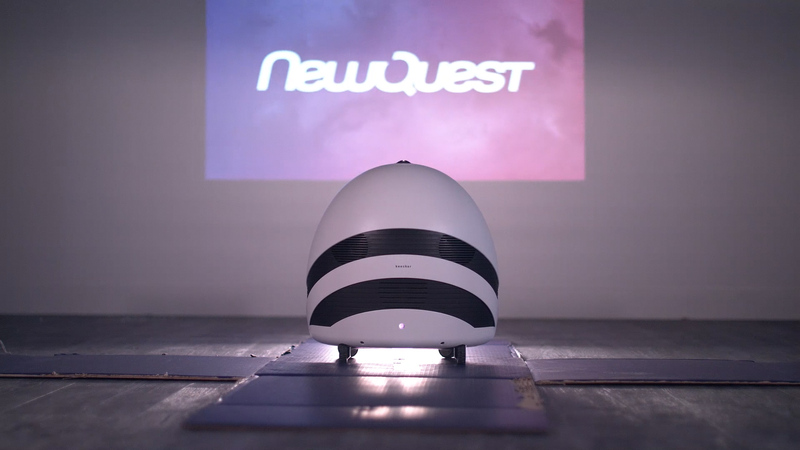 First launched in the USA via Kickstarter, this small, autonomous robot is full of surprises! Entertainment, communication or even security, Keecker has just arrived in France ready to conquer our homes… and our hearts! Keecker: the name came from “kick”; Keecker is a small, oval shaped robot who’s all set to revolutionize the way you consume multimedia products in your home! We might even say it’s going to “keeck start” your lives!). More seriously, Keecker is the idea of a…French start-up! Pierre LEBEAU, former product manager at Google, launched the project in 2012, but had to wait until 2014 – via his Kickstarter campaign in the United States – to see Keecker truly come to life. Presented as the first autonomous robot controlled by voice command, it has been designed to be your favorite companion to keep you company and entertain you in your home!  Mobile and autonomous, this little robot provides a concentrated package of high technology, housed in a case that’s 39 cm high and weighs 9.5 kg, the perfect dimensions for an entertaining companion! As far as multimedia goes, Keecker has a high definition 90-degree video projector, a 4.1 surround sound system and a full 360° video camera, everything you need for hours and hours of entertainment. Connected, it’s equipped with Bluetooth, WIFI and even Chromecast. Full of smart sensors, Keecker’s equipped with GPS, a compass, an accelerometer, infrared sensors, and a 3D camera enabling it to map the surrounding environment and so move around without collisions. Also provided with voice command and temperature and humidity sensors, Keecker is able to understand and interact with its environment. Designed as a multimedia device with independent mobility, its multiple functions let you watch films, TV series, or any type of videos thanks to the high definition 90-degree video projector and listen to music using its high-fidelity sound system. Added to that, its numerous sensors, cameras and voice command let you monitor the security of your home and measure the quality of your environment (the levels of humidity, temperature, light…). As it’s compatible with Android TV, you can use any of the applications available on PlayStore directly on your Keecker and connect to all your favorite video and audio streaming, VOD and direct TV platforms, as well as games and lots more surprises! More and more of the objects we use on a day-to-day basis are a concentrate of high-end technologies and features. Think of our smart phones: real pocket computers, not just telephones but also mini TVs, game consoles and much, much more! What if it were possible to simplify the technology used in our homes to make it too, more compact, smarter, more mobile… in other words: more fun? It’s the objective that the French start-up and its highly motivated team set themselves for Keecker! Designed to bring a revolution to our homes, Keecker replaces your TV, your sound system, your webcam, your security cameras even your thermometer. The first autonomous robot controlled by voice command, it both simplifies all the functions we need in our daily lives and makes them more mobile… wireless! Keecker is able to situate itself and move around alone, using its sensors and the mapping of your home set up when you installed it. All that’s left for you to do is to tell it where to go, and it carries out your instructions. No need to worry about recharging it either, once it knows where the charging dock is, Keecker is smart enough to do that on its own whenever it detects low power levels. You can also interact with your Keecker via any connected device equipped with the Google assistant, such as a loud speaker connected to Google Home for example. The assistant connects directly to your robot to transmit your commands. Keecker’s API opens an entire range of possibilities. Even if all the features will not be open (as Pepper’s are, for example) and even knowing that we’ll always be limited by the robot’s own capabilities, we’re really getting excited about the world of possibilities promised by upcoming updates and future applications. RECEPTION: What if Keecker could take over reception in your company? Using a key phrase or by detecting people’s presence using its 360° camera, it could automatically play a welcome video presenting your company. MEETINGS: For long distance meetings, get your interlocutors fully involved in your discussion using Keecker’s 360° roaming camera. No more need to share a single webcam, suddenly, your video conferences take on a whole new dimension. SALES EVENTS: We’ve already talked about using robots in sales areas, why not Keecker? Imagine setting it up in your store to provide extra information to interested customers. Presentation videos, tutorials, recommendations for use or perhaps consumer reviews. Quality content for a fun way to support your customers in their purchasing experience. FACILITIES MANAGEMENT AND SECURITY: why not use Keecker’s vast number of sensors and its connectivity, to control your working environment: temperature, light, humidity: what if Keecker was your route to smart connected buildings? The 360° camera and the mapping of the surrounding environment could also be used as a security camera to monitor your premises… from home using your smart phone. MOVING FORWARD… There are countless possibilities, and we have lots more ideas to suggest. In an interview, Pierre LEBEAU also mentioned the idea of using Keecker with its 360° camera combined with Oculus software. From that starting point, it’s easy to imagine using both at a trade fair to immerse your visitors in a live visit of your company or let them explore an art gallery or museum. Once again, the gap between today’s technology and our wildest dreams for robotics is closing fast, opening up great hopes for the future. Now we just have to keep a close watch on the next updates and new applications for Keecker, a robot that’s small… but powerful!